I'm trying to learn by myself the principles of a voltage boost converter. I noticed that many sources* suggest not putting a resistor in series with the capacitor (as in the picture). No way. The choke gets filled when transistor conducts, the current start to rise from 0 to some level. Then you switch off the transistor. What happens with the current? It still flows with the same magnitude for the very first moment, into a capacitor of course, and then starts decaying. The current through inductor is continuous. Not the answer you're looking for? Browse other questions tagged voltage capacitor dc-dc-converter boost or ask your own question. Is a bleeder resistor on a small circuit mandatory at the decoupling capacitors? IC boost converter performs poorly in breadboard prototype circuit: is this to be expected? 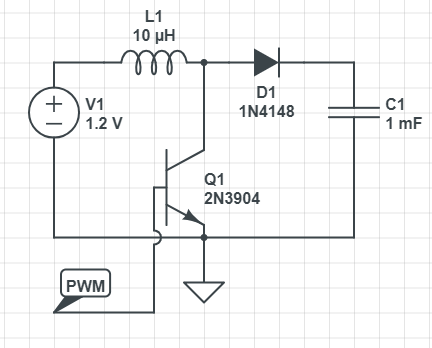 Does a boost converter lower the source current of a solar panel? What is the name of this DC-DC converter topology?